Food waste is a tuff nut to crack. It is high in water content, heavy and varies highly in composition, structure: bones, fish-skin, rice, pasta, vegetables. Food waste also decays rapidly by bacteria under higher ambient temperature causing odor and smells. Processing at the source such as: galley, scullery or mess is the most hygienic solution. Depending on the expected volumes we can advise from our range of solution and machinery such as: macerators, heavy duty shredders, waste processing stations, grease separators and holding tank solutions. 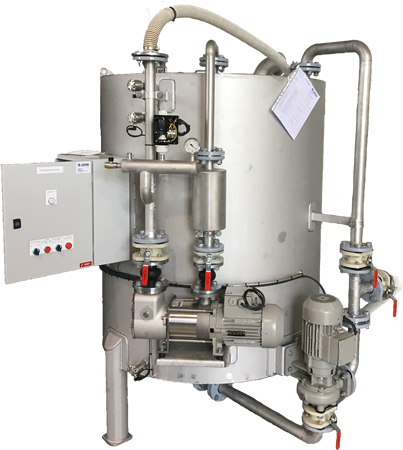 The food waste slurry conveying to the holding tank can either be: gravity based or vacuum based to prolong the holding time before discharge. With the implementation of the revised Marpol 73/78 Annex V regulations ship’s are obliged to comminute food waste before discharge into the sea is allowed within certain areas. Food waste grinders or macerators are used to physically reduce food scrap to particle sizes below 25 millimeter for proper dispersion with seawater. Fresh water is used to convey the waste or slurry through vessel’s drain system and /or overboard. Most common installed are gravitational drain system, although ships with high waste volumes prefer vacuum operated systems, due to much lower water consumption and slurry volume generated.